Former winning jockey Hywel Davies says he fears for the future of the Grand National after a number of changes were announced for the Aintree race. Changes have been made following a safety review, which was prompted after the deaths of two horses in April. But Davies, who won the 1985 Grand National on Last Suspect, fears the changes could ultimately spell the end of the race and National Hunt racing. "I think we're doomed, that's my honest opinion," Davies told BBC Sport Wales. "They're going to make it so safe that it's going to take all the spectacle away. "Horses are still going to get killed and then they're going to say we can't have this and they'll stop the race. "After that the National Hunt is going to go. It's gone in Europe . I think jumping's doomed eventually." 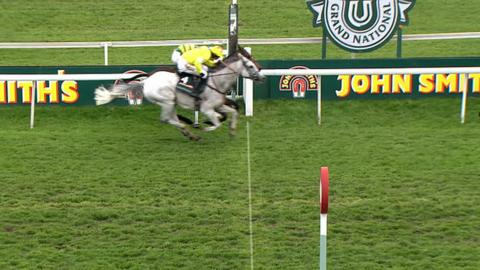 An official inquiry was launched after the deaths of According To Pete and the Cheltenham Gold Cup winner Synchronised during this year's race at Aintree. Changes have been announced by Aintree and the British Horseracing Authority following a safety review. They include the start being moved 90 yards closer to the first fence, while measures will also be taken to stop horses getting caught up in the starting tape. The field size is to stay at a maximum of 40 but Davies believes the changes will not avert future deaths. "It's all geared to make it safe for horse and jockey but in actual fact what they're doing is making it more dangerous," Davies said. "Speed kills as everyone knows. The faster you go the more likely you are of getting an accident and it's the same with horse racing. "Making the start closer to the first fence so they don't get much speed by the time they get there is all great when you've got about 10 or 12 runners. "But when you've got 40 you need that distance to actually get into position where you've got a clear run of the fence. "I rode in 10 Grand Nationals and I didn't see the first fence or my line until I got over the Melling Road, well over a furlong from the start. "If they're going to start at the Melling Road by the time you get to the first fence I'll guarantee you 10 of them are not even going to see the fence."